The original five that started it all. Himitsu Sentai Goranger (Secret Squadron Goranger) was the first entry in the Super Sentai franchise (although it and its direct successor JAKQ Dengekitai were simply recognized as the plain "Sentai Series" until years later) , airing from 1975 to 1977, lasting 84 episodes and a movie (longer than any of its successors). The evil terrorist group known as the Black Cross Army is threatening the world, so the Earth Guard League (EAGLE) is set up to defend it. The Black Cross Army destroys EAGLE's bases in Japan, but five secret agents survive, using superpowered battle suits to become Goranger, and take revenge against the forces of evil. Tsuyoshi Kaijō / Aka Ranger: The Hero. A master tactician and soccer player. Akira Shinmei / Ao Ranger: The Lancer. A cowboy and marksmanship instructor. Daita Ōiwa / Ki Ranger: The Big Guy as a judo master. He is a mathematician and engineer, making him a Genius Bruiser. Loves curry rice. Temporarily replaced by Daigorō Kumano until Kumano was Killed Off for Real. Peggy Matsuyama / Momo Ranger: The Chick. The demolitions expert and a chemist. Kenji Asuka / Mido Ranger: Kid Appeal Character. The hotheaded youngest member. Black Cross Fuhrer: Big Bad, Eldritch Abomination. Sun Mask: The first Dragon and a Dirty Coward. Iron Man Mask General Temujin: The second Dragon. Fire Mountain Mask General Magman: The third Dragon. By the Power of Greyskull: GO! Color Coded for Your Convenience: The codenames used each member's respective color as the head word and the word "Ranger"/"Renger" as the tail. Unlike the majority of Sentai shows from Denziman and onward, the codenames used the Japanese names for the colors instead of English ones (i.e. "Aka" instead of "Red"). Cool Airship: The Variblune, which is destroyed in #42 and replaced by the Varidorin during the same episode. Cool Bike: The Goranger Machines, which consist of one solo bike for Aka Ranger (the Red Machine) and two sidecar-equipped bikes for the rest of the team (Ao's Blue Machine and Mido's Green Machine, which are shared with Ki and Momo respectively). The Goranger Machines are later destroyed and replaced with the Star Machines, which also consisted of one solo bike (the Red Star) and two sidecar bikes (the Blue Star and the Green Star). Eyecatch: Goranger's eyecatch features illustrations of the Goranger team. The Big Guy: Daita (#1-54 and #67-84) and Daigorō (#55-67). Home Base: The Goranger Room hidden underneath Snack Gon. Idiosyncratic Episode Naming: Each is an Excited Episode Title with the name of a color in it. In the Name of the Moon: See page quote. Law of Chromatic Superiority: Suit design-wise, there are several things which make Aka Ranger stand out as leader among the Gorangers. He has a yellow "V" shape across his chest, while those of his teammates (the amount depending on their number) are colored red. A yellow "1" is placed atop his visor with eagle wings coming off from it. These wings are lacked by the other Goranger's, with the color of the number being silver for the other men and red for Momo Ranger. His collar is much taller than the other four. While Ao, Ki, and Mido have black visors, Aka has a blue visor, while Momo's is red. He wears white boots and gloves, this is shared by Momo Ranger, while the other men have black boots and gloves. Mid-Season Upgrade: Episode 43 in particular, which is focused on showing the team's new powers, weapons and vehicles (including a new finishing move). Elite Mooks: The Black Cross Army Stealth Corps (featured in Episode 64 and onward). Praetorian Guard: Golden Mask has two imperial guards who are always on his side. Mookmobile: The Condolas, aircraft that assaulted the Gorangers. The Movie: Five of them; but the first three and the fifth were just theatrical showings of select TV episodes (specifically 6, 15, 36 and 54). Only the fourth one, "Bomb Hurricane," was an all-new work and it takes place during Daigorō's brief tenure on the team. The Smurfette Principle: Momo Ranger, who not only wears pink, but has a red valentine heart-shaped visor on her helmet and uses the earrings on her helmet as small grenades. However, the Gorangers are assisted by a secret agent named Yōko Katō, who serves as the show's second heroine. Yōko even wears the Momo Ranger suit in two different episodes. 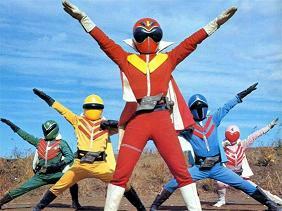 Super Sentai Stance: Surprisingly the stance in the lead image isn't used until very late in the series. Supervillain Lair: The Black Cross Castle. It's later learned the Fuhrer is actually a part of the castle itself. Weapon of Choice: Each ranger's signature weapon materializes from their goggles/"eye masks". Goranger Storm: A soccer ball. Tsuyoshi: (New) Red Vute  and Silver Shot. Daita/Daigoro: Ki Sticker and YTC . Peggy: Earring Bombs, Momo Mirror and Momo Card. Kenji: (New) Midomerang and Mido Puncher. Big Eater: Ōiwa Daita orders four extra large bowls of curry in the first episode. Sorry to break it to you, pal, but our large bowls of curry are extra large. How 'bout just starting with two, huh? The Chew Toy: Daita seems to be the team member who most often has the bad luck in the team. Chuck Cunningham Syndrome: At the start of the series, Commander Edogawa is assisted by three female secret agents who help out the Rangers. Their names are Yōko Katō (007), Tomoko Hayashi (008) and Haruko Nakamura (009). After several episodes, Tomoko and Haruko stop showing up completely and only Yōko remains as a regular character. Engrish: The team's name is meant to be "Goranger" (as in "Five Rangers"), but it's spelled "Gorenger" on their bikes (as well as on Commander Edogawa's patch and the flags on their Star Machines). This misspelling is still used by the official merchandise as an artifact from this mistake. Homage: To Benny Hill of all things in Episode 70, which has a scene where Asuka, Peggy and Daita replace a car's flat tire in fast-motion. Improbable Weapon User: The Gorangers fight with standard weapons, but when it comes time to finish of the monster, they summon a mighty...soccer ball. Which somehow causes the enemy to explode by beaning him in the head. Later on, they use the Goranger Hurricane: an American football with fins on it, which rather than exploding turns into whatever the villains fear or are weak against. More recent fans will probably remember it as the move that turned into a garbage truck in Kaizoku Sentai Gokaiger's first episode. Kiai: The Zolders shout out a distinctive "hoi" whenever they attack their victims. Market-Based Title: Was called Star Rangers when it was broadcast in the Philippines. Name's the Same: Episode 53 centers around a mad scientist named Dr. Shinigami, not to be confused with the one from Kamen Rider. Prop Recycling: Many of the Masked Monsters wear similar body suits such as Yakyū Kamen (Baseball Mask) and Terebi Kamen (TV Mask). The most notable is Tiger Kamen (Tiger Mask), who is a recycled version of Kōtetsutora Kamen (Steel Tiger Mask). Real Life Writes the Plot: Ōiwa Daita's temporary replacement. Spell My Name with an "S": The official spelling varies between "Goranger" or "Gorenger" depending on the merchandising (most products tend to favor "Gorenger" though). Suspiciously Similar Substitute: Daigorō, which is probably why he didn't last very long. Theme Naming: The first syllable of each of the original rangers' family name  form the name "Kashiopea", as in "Cassiopeia". Tonight Someone Dies: Daigorō Kumano's final episode was titled "Crimson Special Attack!! Yellow Ranger Dies at Sunset"
Too Dumb to Live: one victim of the week. If you're being chased by a pink telephone monster, and as soon as you think you've ditched it you notice a giant pink telephone... you probably shouldn't use it to make a call. Trademark Favourite Food: Daita and his love of curry, to the extent that Homages in other shows would reference the rollcall first and this second. In one episode, Daita is imprisoned by Witch Mask after being tricked into eating a bowl of curry that happens to be in a jail cell. Villain Song: "Demonic Black Cross Army"
What Measure Is a Non-Human? : Every battle seems to end with "shoot the monster in the back while he's trying to escape." ↑ "The five men assembled"
↑ Daita the engineer and Peggy the chemist. ↑ Can transform into the Spear Vute, Drill Vute or Red Hunter. ↑ A radio that stands for "Yellow Transceiver"
↑ or in Peggy's case, her given name, since her full name is always written in the western order, even in Japanese.